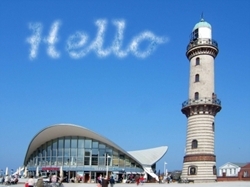 The Sky Writing effect allows you to create cloudy text. You can write your name or any other text in the sky. Sets the X coordinate of the center point of the gradient. The X coordinate is a percentage of the width of the image or selection. Min = 0, Max = 100, Default = 5. Sets the Y coordinate of the center point of the gradient. The Y coordinate is a percentage of the height of the image or selection. Use this option to change the size of the clouds. Min = 2, Max = 2000, Default = 100. Use this option to change the roughness of the clouds. Min = 0, Max = 100, Default = 80. This option allows you to change the font size. The unit of measurement is pixels. Min = 1, Max = 1000, Default = 120. Use this option to change the text and the font (if applicable).